If you are looking for the perfect gift for an animal lover, be it for birthdays, anniversaries, weddings or Christmas, then look no further than our personalised Gift Certificate range! Perfect for animal lovers everywhere, and best of all every penny donated goes towards helping the animals in our care. Select the perfect present for your friend, family member or loved one. 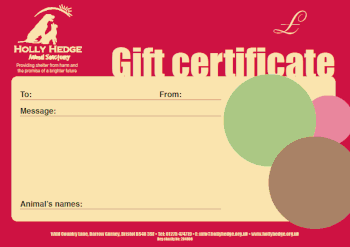 We will send the recipient a gift certificate, with a personalised message from you, details of how the gift has helped the animals at Holly Hedge, and newsletters from the Sanctuary. Email fundraising@hollyhedge.org.uk and let us know the following information: what amount would you like to donate, (minimum of £10) do you want the certificate to feature a cat or dog (or both), the recipient’s name and address and your personal message. We will then send your gift to your friend, family or loved one, and you can feel good knowing that your gift has made a difference to the lives of the animals in our care.